I just went to a friend's wedding this weekend and while it was a emotional, sincere and booze-filled good time, there was no roundhouse kicking at any point during the ceremonies. As you can see by the pic above, that was a clear error. Especially when you consider that the groom is a games journalist in good standing. 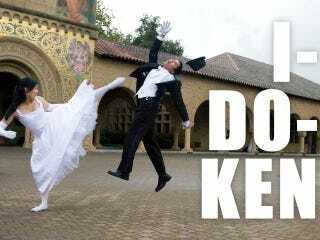 The pic's from Reddit and commenter anyja postulates that it's not actually a wedding, but most likely a staged shot on the Stanford University campus during one of the school's dance competitions. You know what that means. Some lucky unmarried couple can still make this happen.